Doesn't that title sound like a crazy superhero team, right? Hahaha. 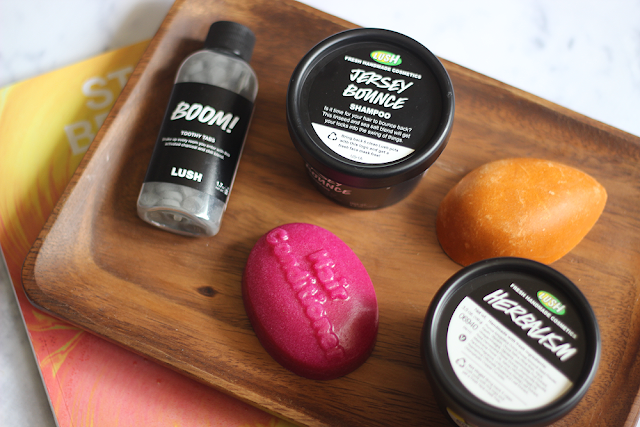 LUSH products, heros - basically the same thing since they both save the day *insert cheesy wink here*. 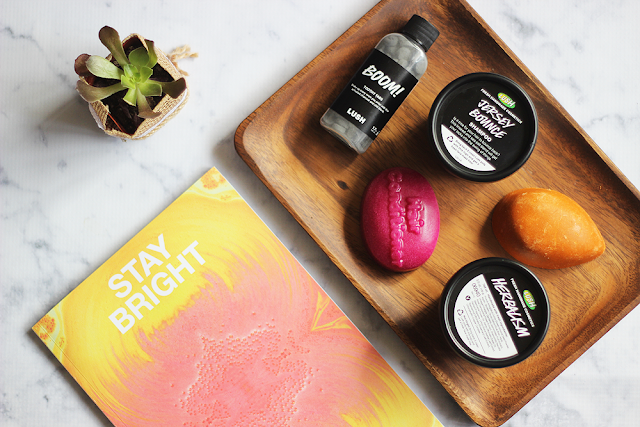 Today, I'm sharing some new goodies from LUSH - and you're definitely going to want to scoop these babies up! Let's check 'em out! Pumice Power ($4.50) - I'll be honest. My feet have seen better days. For most of the summer, they're either in flip flops or I'm barefoot so needless to say, they're in dire need of TLC come fall. This pumice is exactly what the doctor ordered! The scent is nice and citrus-y from from the orange oil infused into it. I get it all nice and sudsy in the shower and then exfoliate my feet with it for soft, rejuvenated skin. I also have used this on my arms with similar softening results! Jersey Bounce ($9.95) - I cannot get enough of this shampoo! It's my absolute favorite right now. You only need the smallest amount to lather up your whole head. I have pretty long hair and used about a half dollar sized amount! Jersey Bounce contains a crazy mix of sea salt (for texture and volume), linseed decoction (for softening) and honey and organic free-range eggs (for extra softening and conditioning). My hair always feels squeaky clean after using this without feeling dried out. I love it! Herbalism ($15.95) - While this cleanser is more suited for oily/troubled skin, I have normal/slightly dry skin and still had great results. It contains kaolin clay and rice bran (to soak up any excess oil), rosemary, nettle and chamomile (to tone) and chlorophyllyn extracted from alfalfa plants to balance out the oils on your skin. Clearly, it has a lot of ingredients to keep the oil at bay but even with my normal skin, I noticed it left my skin feeling soft and just left everything feel nice and tight. It didn't dry me out at all. The Plumps ($17.95) - Is it a conditioner? Is it a texturizer? It's a mix of both! The Plumps contains sea salt and honey to get that hair high AND soft. It also has this yummy cedarwood scent that sticks around for awhile after you get out of the shower. This + Jersey Bounce = a match made in heaven! Boom! Toothy Tabs ($9.95) - Lastly, we have these babies which are so new to me! I had no clue they made toothpaste in a tab form but I love the idea of it! Pop one of these in your mouth, chew and then grab a toothbrush to brush it around and rinse. The toothy tabs is a mix of charcoal, gunpowder tea, chili powder and black pepper with a cola flavor! What are your absolute favorites from LUSH? I am so obsessed with lush, I have always loved their coffee face mask! I am yet to try the toothy tabs, but I have heard such good thing I can't wait to pick them up! !